Temperament: The West Highland White Terrier is an alert, happy and courageous dog. They are very friendly even toward strangers. Family Dog: The West Highland White Terrier gets along well with well-behaved children but may have a tendency to snap when irritated or teased. Westies are usually even-tempered dogs, but some males may pick fights with other male dogs. They may not do well with cats. Shedding: The West Highland White Terrier is a low shedder. Grooming: The coat of the Westie is fairly easy to groom. They need a regular brushing with a stiff bristle brush. They should be bathed only when necessary. The fur around the ears and eyes needs to be trimmed with blunt-nosed scissors. The entire coat should be trimmed every four months and stripped two times a year. Barking: The Westie likes to bark. Exercise: The West Highland White Terrier should have a daily walk. The can also get daily exercise during indoor play-time. 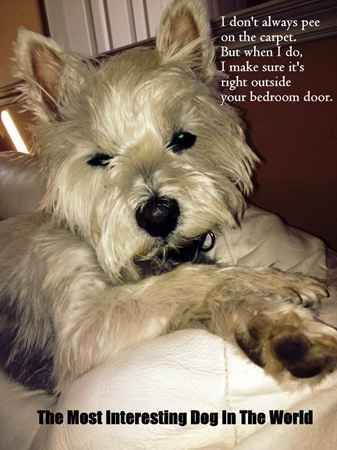 Living Conditions: The West Highland White Terrier make a great dog for any living arrangement. They are active inside and do not need to have a yard but would love an outdoor romp if available. Appearance: The West Highland White Terrier is a small, balanced and very confident dog. They have a strong build, deep chest, straight back and muscular legs. The coat of the West Highland White Terrier consists of two inch long white fur. The double coat has a hard outercoat and soft undercoat. Size: A male West Highland White Terrier should be 11 inches tall at the withers weighing 15 to 22 pounds. Females should be 10 inches tall and have a weight around 13 to 16 pounds. Companionship: Westies make great companions. Head: The Westie's head should be proportionate with the size of the body and round in shape. Westies have an inquisitive and piercing expression. The head should be slightly longer than the muzzle and domed on top. Nose: The West Highland White Terrier has a large black nose. Eyes: The eyes of the West Highland White Terrier should be set widely apart. They are dark brown in color, almond shaped and of medium size. The brows should appear heavy and full. The eye rims should be black in color. Ears: The West Highland White Terrier has small, pointed ears that are carried erect. They are spaced wide on the top outer edge of the head. The ears should never be cropped. The coat on the ears is short giving a velvety smooth appearance. Muzzle: The Westie has a blunt muzzle that is just shorter in length than the skull. The muzzle is tapers toward the nose. Teeth/Bite: The jaws of the Westie are powerful and meet in a level bite. The lips should be black in color. The West Highland White Terrier has very large for their size. They have a sixth incisor tooth between their canines on both the upper and lower jaws. Neck: The West Highland White Terrier has a muscular neck. Its length should be in proportion with the size of the body. Body: The West Highland White Terrier has a balanced and compact body with a level topline. The ribs and chest extend to the elbows and are deep and arched. This gives the Westie a flat side appearance. Forequarters: The shoulders of the West Highland White Terrier are well laid back. The upper arms should be of ample length and angled allowing for definite body overhang. The West Highland White Terrier front legs are short, straight and muscular. They are covered with a thick coat of short hard hair. The elbows should be in the vertical center of the leg. Hindquarters: The rear legs of the West Highland White Terrier are very muscular, well angulated, not spaced too widely apart. The hocks should be short, parallel and bent. Gait: The West Highland White Terrier's gait should be free, straight and powerful with proper reach and drive. When looking from the front the legs do not appear to move squarely, but toward the center of gravity. The topline should remain level at all times. Feet: The West Highland White Terrier's front feet are larger than the rear feet, round in shape and sized proportionately to the body. They have thick pads and may out-turn slightly. The dewclaws may be removed. The pads and nails should be black in color. Tail: The tail of the West Highland White Terrier is relatively short and shaped like a carrot. When erect the tail should never reach above the top of the head. The coat on the tail is straight and hard in texture and should not be feathered. The tail should be carried gaily but never curled over the back. The West Highland White Terrier tail should never be docked. Color: The West Highland White Terrier has a white coat as the name suggests. Coat: The West Highland White Terrier has a double coat. The coat on the head must be plucked to give the round appearance. The outer coat is hard in texture, about two inches in length except on the neck and shoulders where it is shorter in length. Life Expectancy: The West Highland White Terrier has an average life expectancy of 15 or more years. Characteristics: The West Highland White Terrier makes a great watchdog. They love to dig. Health: The West Highland White Terrier is a fairly healthy breed but may be prone to chronic skin problems, Perthe's disease, hernias, liver disease and jawbone calcification. History: The West Highland White Terrier was originated during the middle of the nineteenth century. A Cairn Terrier breeder in Argyll, Scotland had some white pups in his litter. They were then bred together to develop the West Highland White Terrier.